Today, Sydney-based startup High Earth Orbit Robotics (HEO) announced that the Space Data Association (SDA) has signed a Letter of Intent to use data gathered from HEO’s planned nanosatellites. 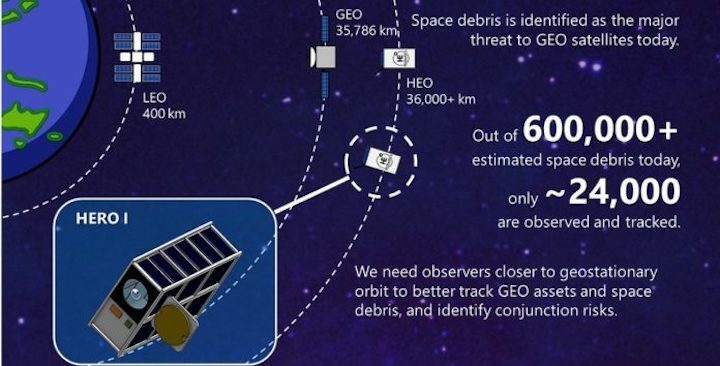 Under the agreement, SDA, an organization whose members include some of the world’s largest satellite operators, will use HEO data to assist in warning spacecraft in Geostationary Orbit (GEO) about space debris. According to HEO, the company will use a family of nanosatellites it is currently designing, known as HERO-1, to track space debris in GEO. Each unit of HERO-1, a 6U space telescope, will be placed in a supersynchronous orbit 500km above GEO, in High Earth Orbit. The spacecraft will use a snapshot hyperspectral camera and telescope to captures high quality spectral data, making it able to track geostationary space debris during the data and in all weather conditions. Aside from space debris, HERO-1 will also be used to detect asteroids, for a near-earth asteroid prospecting mission known as Mission Salus. This will be done using the satellite’s ion-thruster, which will enable it deviate for its orbit and move to get close-up views of each asteroid. Last month, HEO teamed up with the Australian Centre for Space Engineering Research (ACSER) at the University of New South Wales Sydney (UNSW) to develop navigation solutions for cubesats at high altitudes, so that cubesats will be able to use GNSS services to maneuver above 1,000km.